BSE Sensex closed higher by 89.63 points, or 0.26%, to 34,395.06, while the Nifty 50 gained 20.35 points, or 0.19%, to close at 10,548.70. Among the sectoral indices on BSE, power, realty, consumer durables, FMCG and utilities gained over 1%, while IT, teck and healthcare declined. BSE MidCap and SmallCap rose 0.28%. 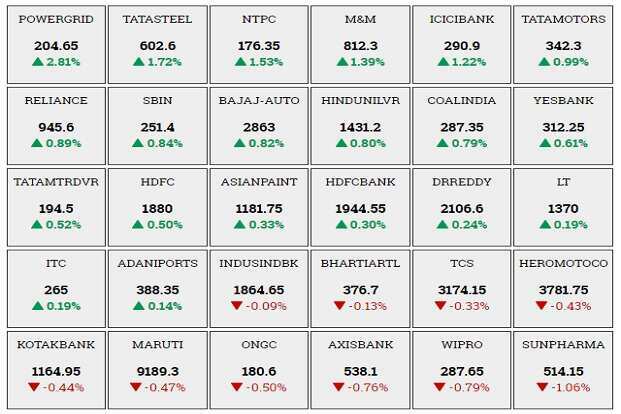 Power Grid, NTPC, Hindustan Unilever and ICICI Bank were top gainers, whereas Axis Bank, Sun Pharma, Adani Ports and Wipro were among the major losers. BSE Sensex traded higher by 117.89 points, or 0.34%, to 34,423.32, while the Nifty 50 gained 31.75 points, or 0.30%, to 10,560.10. The Indian Hotels Co. Ltd shares rose 5.79% to Rs147.95 after the company said that it has forayed into Makkah, Saudi Arabia, with a partnership with Umm Al Qura Development and Construction Co. The finance ministry may come out with a Rs10,000-crore follow-on fund offer of the Bharat-22 exchange traded fund (ETF) as it looks to dilute stake in Coal India to meet the minimum public holding norm. Besides, the ministry is keen to take the ETF route to sell off government shares held through the Specified Undertaking of the Unit Trust of India in private companies (SUUTI)—ITC, Axis Bank and L&T, an official told PTI. Tata Communications Ltd said it has partnered with Dreamtime Technologies (Pty) Ltd to build a new cloud-based virtual mobile network to serve African mobile and IoT providers. Tata Communications shares were up 0.39% to Rs623.05. Schaeffler India Ltd said its March-quarter profit rose Rs66 crore from Rs57.48 crore a year ago. The company’s quarterly revenue from operations stood at Rs521 crore, compared to Rs497 crore last year. Schaeffler India shares gained 0.41% to Rs5318.15. BSE Sensex traded higher by 67.93 points, or 0.20%, to 34,373.36, while the Nifty 50 slipped 11.55 points, or 0.11%, to 10,539.90. Capricorn Food Products India Ltd, an integrated food processing company, has received approval from the Securities and Exchange Board of India (Sebi) to float an initial public offering (IPO). Going by the draft papers, Capricorn Food’s IPO comprises a fresh issue of equity shares worth Rs171 crore and an offer for sale of up to 76.43 lakh scrips by the existing shareholders. Muthoot Capital Services Ltd reported a net profit of Rs21.52 crore in the quarter ended 31 March, compared to Rs11.12 crore a year ago. Revenue from operations rose to Rs119 crore versus Rs79.86 crore in the same period last year. The company’s shares fell 3.73% to Rs961.25. BSE Sensex traded lower by 60.73 points, or 0.18%, to 34,34.244.70, while the Nifty 50 slipped 26.35 points, or 0.25%, to 10,502. Among the sectoral indices on BSE, power, utilities and consumer durables were leading the gains, while IT, teck and telecom declined. BSE MidCap edged down 0.07%, while SmallCap gained 0.04%. Power Grid, NTPC, Hindustan Unilever and M&M were top gainers, whereas Wipro, Sun Pharma, Axis Bank and Infosys were among the major losers. The foreign acquisition unit of Oil and Natural Gas Corp. Ltd’s (ONGC) has filed an arbitration claim against the government of Sudan in a London court, a company official said, seeking to recover dues pending for years from a project hit by the breakaway of South Sudan in 2011.People familiar with the matter in India and Sudan said ONGC had filed a claim for $98.94 million, in what they said was a first for the South Asian nation’s top oil and gas explorer against any government. They declined to be identified because they weren’t authorised to discuss the matter with media. Lloyds Metals and Energy Ltd said it has received permission from from Director of Mines Safety to extract ore at Surjagarh iron ore mine at Gadchiroli district, Maharashtra. The company also disclosed that it has received acknowledgement of proposed 15MW electric power generation in respect of the proposed mineral-based steels plant at Gadchiroli. Shares gained 2.54% to Rs18.20. 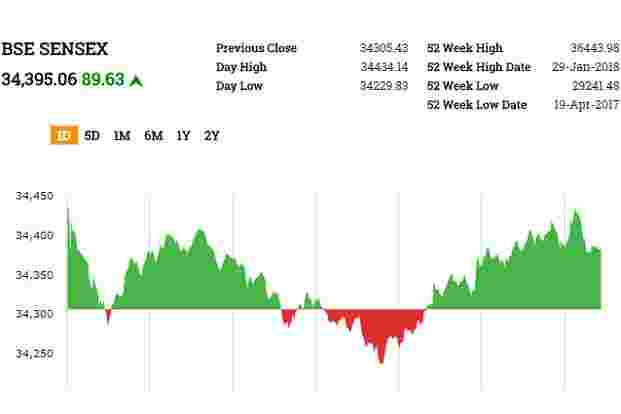 BSE Sensex edged up 5.19 points, or 0.02%, to 34,310.62, while the Nifty 50 slipped 4.15 points, or 0.04%, to 10,524.20. The Indian rupee on Tuesday erased all the morning gains and weakened to an over six-month low against US dollar as India’s trade deficit widened. Also the US Treasury department said that it would be adding India to the list of countries that it considers as potential currency manipulators dampened the sentiment.The rupee was trading at 65.64 against US dollar, down 0.22% from its Monday’s close of 65.49. The rupee opened at 65.46 a dollar and touched a low of 65.65—a level last seen on 3 October 2017. Ashoka Buildcon Ltd said it has received a letters of intention from Dakshinanchal Vidyut Vitaran Nigam Ltd (DVVNL) for projects worth Rs756.79 crore. Shares rose 0.99% to Rs266.55. Gold prices were steady on Tuesday as the US dollar remained on the back foot, with the metal supported by festering worries over US-China trade tensions. Spot gold was unchanged at $1,345.62 an ounce as of 8.52am. US gold futures eased 0.2% to $1,348.4 an ounce. BSE Sensex traded higher by 101.17 points, or 0.29%, to 34,406.60, while the Nifty 50 gained 19.50 points, or 0.19%, to 10,547.85. All the sectoral indices on BSE, except IT and teck, traded higher led by power, which gained 1.29% followed by utilities 1.12% and metal 1.04%. BSE MidCap and SmallCap rose 0.44% and 0.58%, respectively. Mahindra and Mahindra Ltd shares gained as much as 2.23% to hit an intraday high of Rs819.10 a share on BSE. Currently, the market cap stands at Rs1.01 trillion. At 9.35am, the shares were trading at Rs812.85 apiece on the BSE, up 1.5% from its previous close, while India’s benchmark Sensex index rose 0.01% to 34,309.96 points. Bajaj Electricals Ltd rose 6% to Rs653.90 after the company said it got orders worth Rs3,578 crore for rural and urban electrification projects in Uttar Pradesh. The Indian rupee on Tuesday strengthened marginally against US dollar after local equity markets gained for eight consecutive sessions. The rupee was trading at 65.43 against US dollar, up 0.10% from its Monday’s close of 65.49. The rupee opened at 65.46 a dollar. Yields on 10-year government bond stood at 7.481% from its previous close of 7.49%. Bond yields and prices move in opposite directions. BSE Sensex traded higher by 16.32 points, or 0.05%, to 34,321.75, while the Nifty 50 gained 4.85 points, or 0.05%, to 10,533.20.